Guimar is a laid-back holiday spot away from commercial developments and the tourist-congested south coast of Tenerife. The town features impressive architecture and churches that date back to the 15th-century. An excellent array of pristine sunny beaches makes the Guimar a haven for nature lovers. Its proximity to natural wonders such as Malpais de Guimar National Park makes it an ideal starting point for hikers and outdoor adventure seekers. One attraction of the town that, without a doubt, stands out are its mysterious pyramids. Theories about these pyramids date back to well before the days of Spanish colonization. Today, an ethnographic park with lovely gardens and a museum surround these six rectangular pyramids. The Pyramids of Guimar look more like the ones seen in Central and Mesoamerica than the Pyramids of Egypt. These structures built from lava stone reach as high as 12 meters. At a closer look, each pyramid has a stairway to the top. Instead of pointed summits, the upper part of the monuments is flat and covered in gravel. The stairways are all on the western side, suggesting a ceremonial purpose. It is believed that someone ascending the pyramid in the morning would be welcoming the rising sun, a significant religious act. The location of the site also makes it look as if the sun is rising out of the water, which might have an added significance for a ceremony. These mysterious gems were also mentioned in the earlier writings during the Roman Empire. Roman philosopher Pliny the Elder, for instance, wrote about how the Canaries were completely uninhabited. For centuries, the origin of these pyramids remains obscure. The existence of the Pyramids of Guimar became popular in the early 1990’s. Since then, the structure has attracted experts from all over the world. Various theories exist, and thorough studies had been conducted to know the origin of the pyramids. Some researchers maintain that they were merely heaps of stones left by farmers clearing the land for cultivation. Others have more in-depth inkling and explanations. Norwegian anthropologist and explorer Thor Heyerdahl has dedicated much of his life to researching the cultural origins of ancient civilizations throughout the world. He believed that the pyramids’ construction details resemble the architectural principles used in the Old and New Worlds. As such, he theorized that the Guanches might have built the pyramids long before the Spanish colonization. Furthermore, he suggests that there is a link between the seafaring people from Egypt and Central America. From 1991 to 1998, a team of archaeologists from the University of La Laguna and the FERCO (Foundation for Exploration and Research on Cultural Origins) conducted a series of excavations. After discovering potteries from the mid-nineteenth century, they believe the pyramids were built during that period. In 1991, researchers from the Institute of Astrophysics of the Canaries conducted a study of the archaeo-astronomical characteristics of these structures. These investigations showed that the pyramids are oriented astronomically to the summer and winter solstices. In 2005, a book was published suggesting that the Masonic symbolism motivated solstitial orientations of the pyramids. The authors believed that solstices are very important in the symbolism of Freemasonry. They also pointed out that the owner of the land in the era in which the pyramids were built was himself a Freemason. There’s more to the Pyramids of Guimar Ethnographic Park than the age-old pyramids. Featuring a remarkable museum, gardens and a leisure area, this attraction combines relaxation and entertainment with rich history. The Casa Chacona Museum is located on the ground floor of a nineteenth-century house. From the outside, the museum is dazzling with its chic colors contrasting with the blue skies and lush landscape behind. Upon entrance, the statue of Kon-Tiki, a pre-Incan sun god, welcomes the visitors. The first room showcases sculptures of the bearded gods of Mexico and Peru. The second room is an introduction to Thor Heyerdahl and his cultural parallelisms theory. On the other rooms, visitors will find one of the largest photographic collections of pyramids and step structures of the world. An in-depth explanation of the Guimar Pyramids and its theories of origin are also available. The Poison Garden houses over 70 toxic plants from all over the world. This green space with a clear, natural appeal is unique in the Canary Islands. It aims to educate and raise awareness about the danger of the poisons present in the plant world. On the other hand, the Sustainable Garden is an attractive space that reproduces a typical Canarian ravine. The garden educates visitors on the different aspects affecting sustainability in general. The Leisure Area consists of a playground for the younger visitors and a souvenir shop. The shop provides handcraft products, a selection of anthropology books and a variety of local items. This part of the park also features a charming cafe that offers a magnificent panoramic view of the pyramids. For ultimate convenience, guests often book a group tour with hotel transfers to get to the site. The ethnographic park that surrounds the Pyramids is located approximately 26 kilometers from Santa Cruz de Tenerife. As an option to hotel transfers, visitors may take the budget-friendly and ever reliable green TITSA bus. Guides and schedules can be obtained from the bus station, tourist office or hotels. Visitors who prefer to drive on their own from Santa Cruz de Tenerife may take motorway TF-1 southward, then take Exit-11 towards Guimar. From Playa de las Americas or Los Cristianos in the south, visitors may take the same highway northward. From the town center, it would be easier to follow these GPS coordinates: 28.3208° N, 16.4138° W.
The Pyramids of Guimar Ethnographic Park is open daily from 9:30 to 18:00. Ticket prices range from €4,50 to 18,00 depending on the type of ticket, as well as the visitor’s age and residency. For convenience, tickets may be purchased from the park’s official website. A trip to the quaint town of Guimar would not be complete without visiting the Pyramids of Guimar. These strange structures are a delight to see up close. Also, the initial efforts of Thor Heyerdahl to not only understand but also to preserve these archaeological wonders are still being carried out to this day. The Ethnographic Park is an excellent example of how one company could fund and conserve this rich heritage of the Canary Islands. At the end of the day, it is not just the unrivaled scenery or the mystery shrouding the Pyramids that amazes the guests. 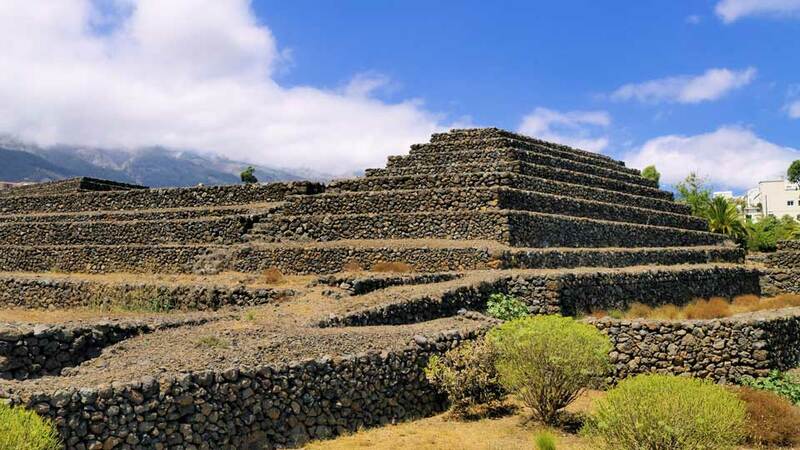 Rather, the connection of these structures and other bits and pieces of the park to Canary Island’s history and heritage is what truly captivates the hearts and minds of the visitors.